Edward Tulane’s life was pretty good. He was loved and looked after by a little girl who lived in a nice house on Egypt Street. He was adored, but he felt very highly of himself and didn’t show as much love back to the little girl as she did to him. One day everything changed. The little girl went on a journey with her parents, taking Edward along for the ride, but they were separated and whilst the little girl knew where her journey was taking her, Edward was completely lost. Oh my, this is not the best book to read on Christmas Eve…. oh the feels! I cried, actually cried, in more than one place, but The Miraculous Journey of Edward Tulane is just as its titled suggests; miraculous, even if it was an emotional roller-coaster. The story starts with Edward having everything and you can tell he doesn’t exactly appreciate it all. He can’t really put his feelings across that well so Abilene, his little girl, thinks he loves her but her grandma can see right through him. She doesn’t think Edward is worthy and tells him so just before Edward is separated from Abilene, and those words stay with him for the rest of the book. Its a sad, sorry tale of being lost but of that being lost helping you understand who you are and making you appreciate things. Edwards journey takes him far and wide, and allows him to meet many different people from all walks of life and that really is one of my favourite parts of the books. I love all the characters we meet, even the awful ones, because it made the book feel real. The idea of Edward having a conscious is something I would have believed in as a child and reading this back then would have felt magical for me so the fact the book has realistic characters would have grounded it into reality more. Everything about this book is beautiful, the story, the writing and the illustrations. I couldn’t put it down once I started reading and even though its terribly sad in places I cannot wait to read it to my children. I honestly thing that every small child should have a copy of this book and a three foot china rabbit on their shelves, it made me long for one! 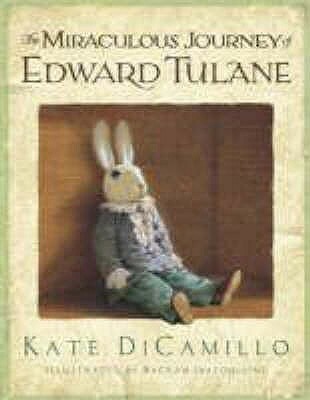 The Miraculous Journey of Edward Tulane had some serious topics and dealt with abandonment issues, death and poverty. The people Edward meet helped give a rounded view of the world and they also helped give across the message that whilst people are not inherently evil or good, and there are blurred lines when it comes to those things, some people need more attention than others have do have mean streaks. I can’t get enough of this book and I honestly will be coming back to it time and time again. Kate Dicamillo has not disappointed with any of her three books I have read during 2013 and I am eagerly awaiting her next book already! The Miraculous Journey of Edward Tulane was published by Walker Children’s Books in June 2008. My copy was purchased at an indie bookstore. The Miraculous Journey of Edward Tulane is a great book in which the author have covered some important concepts of life. There are so many people who want to convert their ideas in the shape of book but due to lack of writing skills they are unable to do this so college application essay writing services provide helpful tips to the students for easy completion of their work.